The flowers of auriculas are so dazzlingly colourful, so faultless and so compact it seems, for once, that Nature is imitating Art. They could be the bright enamel and precious-metal imaginings of Carl Fabergé. Sacheverell Sitwell thought them ‘the perfection of the most exquisite Meissen porcelain, the most lovely silk of Isfahan’. In fact, the auriculas grown today are the result of five hundred years of breeding and selection by auricula enthusiasts to produce flowers in colours not seen in any other group of plants. The palette is a box of jewels: emerald, ruby, gold, silver, amethyst, jade and jet. 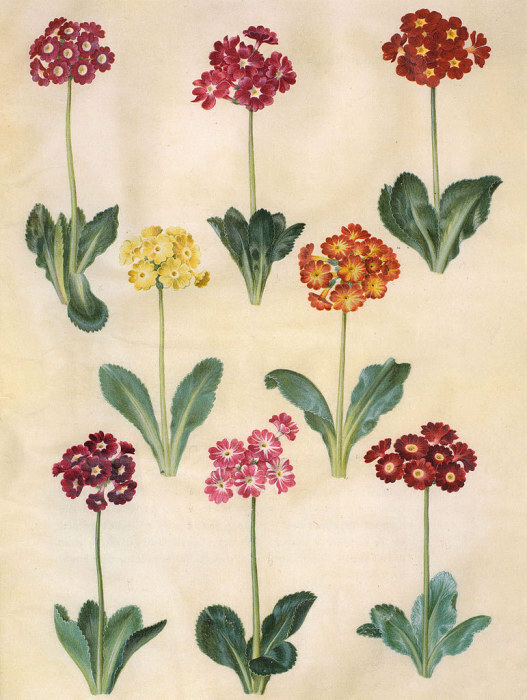 16th century Huguenot refugees are credited with bringing auriculas to Britain, although it is hard to imagine such pious and austere people saving their gaudy auriculas as they fled. Popular interest in the plants peaked during the early 19th century amongst northern hand-loom workers who organised extremely competitive auricula shows to exhibit the plants they had bred. The National Auricula & Primula Society still organises shows, where the molly-coddled thoroughbreds of the plant world are on display. Strict rules govern the size and shape of flowers, the length of the stem, and the way the plants are presented. You can grow auriculas, though, without all the palaver of aiming for show-standard plants. My own auriculas would never be allowed through the door of a public show, although I’m happy to go and marvel at other people’s skill and dedication. But even without constant pampering my auriculas are still the most beautiful of all the plants I grow. Auriculas have a reputation for being fussy plants that are difficult to look after. While they do need regular attention, it’s not arduous, taxing work. No-one every broke into a sweat growing auriculas. Water on the leaves and direct sunlight on the flowers are the two things to avoid. This means that to prevent splashing the leaves, watering has to be done very carefully. Cultivars with silvery, mealy leaves, like a dusting of icing-sugar, are particularly susceptible to water damage. In the winter my plants are stored under a bench in the greenhouse and watered once a fortnight. When they are flowering they are watered every other day. Three- or four-inch pots are an ideal size in which to display auriculas. Clay pots look attractive, but plants dry-out more quickly in these than in plastic ones. While dedicated growers will argue about potting composts, all that is needed is a free-draining mixture. Mine grow in a combination of equal parts of John Innes no. 2, grit and multi-purpose compost. In early March they get a feed with tomato fertiliser to kick-start them into flowering. Old plants stop flowering, so at the end of summer, pot-up the offsets that grow around the base of the plant. This will give you a constant supply of young plants. 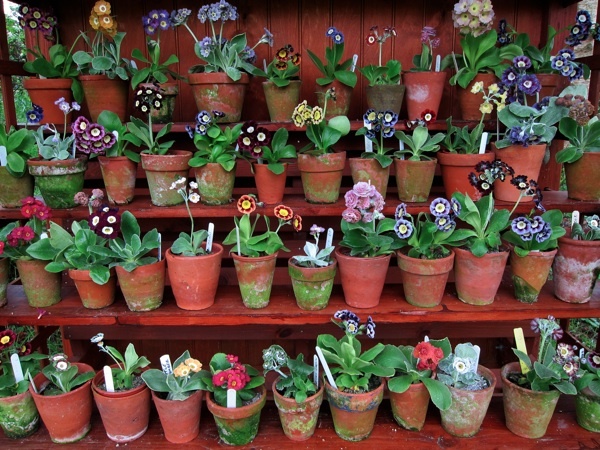 Auriculas are formal plants that benefit from being displayed in an orderly arrangement. The great auricula collections of the past were shown in ‘theatres’ – covered constructions with tiered shelves – like the famous one at Calke Abbey in Derbyshire. I’ve seen old bookcases and converted wardrobes used to create auricula theatres. All that is needed is a place out of the rain and away from the sunlight. Mine are lined out on an old bench under the eaves of a shed. Not five-star accommodation but transformed into a treasure chest by the auriculas. The pleasure they bring when they start to flower is worth all the pampering and cosseting.